These are the colors I am itching for right now, and plan on getting this weekend. Some of them I should have bought earlier in the summer, but better late then never, right? Right. 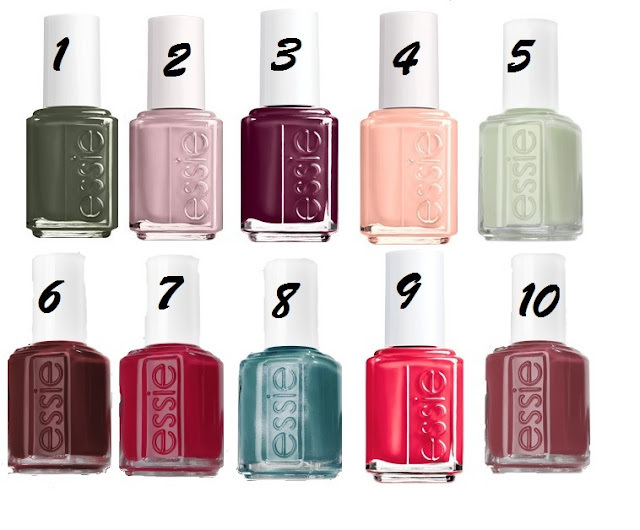 You should head on over to Essie to look at all the lovely colors. That's what I did at work yesterday. And it's addicting. and fun. yep. In other news, best girls night ever last night! Little sister Whitney, me, friends Nicole, Kylee, Heather and Chante met at Maui's Apple for some froyo last night and talked for hours. They are all probably at least or close to ten years older than me. And they are literally the coolest girls I know. As for the weekend, mister worker bee and I have no plans, as he is busy working. It actually feels kind of nice after the last few busy ones. Next weekend it's off to Pheonix for brother-in-laws wedding, and the one after that we're back to school. So we're taking it easy this weekend. Go have a good one!